Living in LA, I find that the fashion and entertainment industries are often bound in a symbiotic marriage. This is the entertainment capital of the world, a world where Hollywood dictates and drives the prevailing fashion trends. Brands and publicists know that if a celebrity is pictured in the the weekly mags wearing their pieces, sales will skyrocket. Therefore, they're more than happy to gift celebs with swag. Lots and lots of swag. After all, the cost of giving a pair of jeans to an "it" startlet like Emma Stone is a small price to pay for what may amount to hundreds of thousands of dollars in free publicity. During award show season (with the word "season" being a misnomer as there's practically an award show every other week in Tinseltown), gifting suites pop up at chic venues all over town as they're the perfect place for the marriage between fashion and entertainment to consummate. 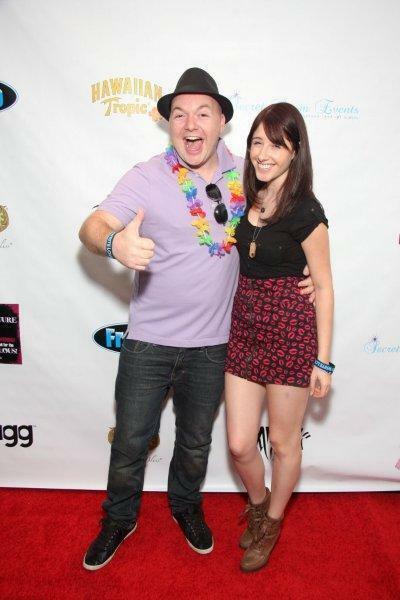 When the MTV Movie Awards was here two weeks ago, I got to attend a few of the best gifting suites in town. The fashion swag was fabulous, the star sightings entertaining. And a Hollywood good time was had. The Secret Room Events gifting lounge was held in the main ballroom of the SLS Hotel. Various nominees and celebrities were there to sample great products while showing their support for The Stymie Canine Cancer Foundation, a nonprofit organization dedicated to helping cancer-stricken dogs. A lot of pet-based vendors were present to give away cool doggie products. Cassidy Lehrman from Entourage. Best smile ever. Romeo! I guess he dropped the "Lil." I got to talk to and sample a lot of great products from the vendors. 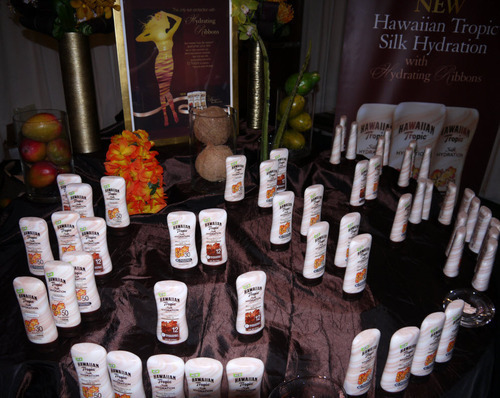 Highlights include Hawaiian Tropics' new line, Silk Hydration which provides ultra moisturizing sun protection. The coconut scent is utterly delectable and I was more than a little tempted to taste it. Don't judge me. Lunch was on my mind. Zensation Skincare is a Swiss line that was developed by one of the world's leading cosmetic labs. The products' unique makeup combines the power of natural plant extracts from the Alps with advanced Swiss biotechnology. The packaging is absolutely beautiful and reason enough to try out the line. Frobo Pet Water Bowl is an unique bowl guaranteed to not only lower the temperature of your pet’s water but to keep it cold and fresh throughout the day with its non-electrical and easy to use “Freezer Core”. Frobo brought two adorable and adoptable puppies to the event which drew a huge crowd. I hope they found happy homes! GBK Productions, the luxury lifestyle gift lounge and special events company hosted their gifting lounge at the rooftop deck of the Parisien beauty L'Ermitage Hotel in Beverly Hills. The view and weather was perfectly idyllic and an ideal way to spend a beautiful summer day in LA! 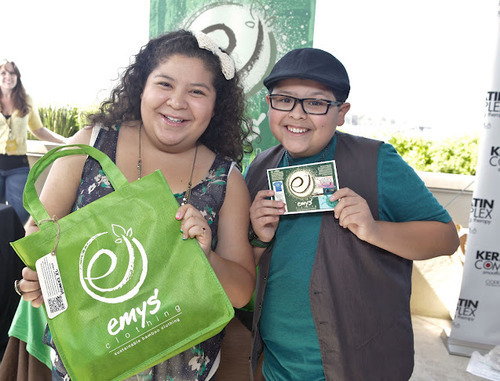 Raini Rodriguez and Rico Rodriguez. I had no idea they're siblings! 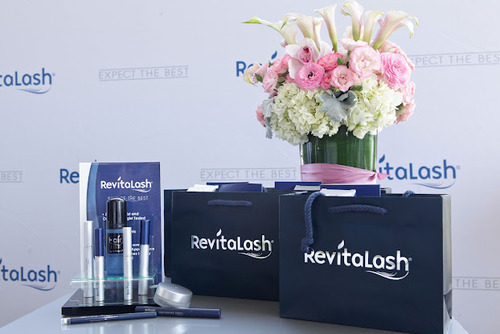 Great gifts included celebrity-favorite RevitaLash ADVANCED. Its new line of products includes the Eyelash Conditioner which features a blend of functional cosmetic ingredients including powerful peptitdes and botanicals. Mascara, eyebrow thickeners and hair products were also in the bulging gift bag. I'm super excited to try Revitalash Fineline Primer which specifically targets the fine lines and shadows around the delicate eye area. I was super impressed by imPRESS Press-On Manicure by Broadway Nails and Kiss Nail Dress products. Touted as the revoluntionary way to apply polish, imPRESS press on nails creates salon-perfect glue free manicures in seconds while Kiss Nail Dress is a fun line of textured nail wrap that helps artistically challenged gals like me create professional looking nail art! 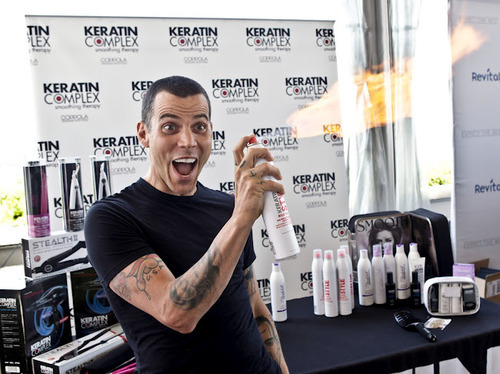 Keratin Complex showcased their at-home product line which includes a full-range of Keratin-infused styling products and tools that increase shine, minimize styling time and reduce frizz. I'm excited to try out its line of products and will do a separate product review on the hair results. 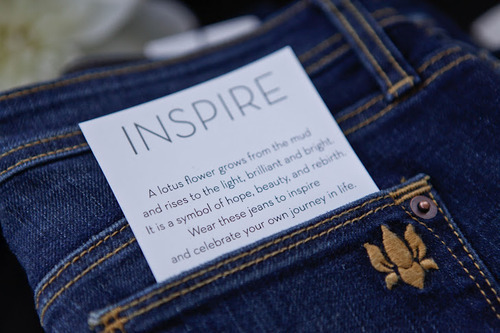 I was intrigued by Lotus Premium Denim, a San Francisco based line which promises to compliment and enhance the leggy shape of the average height woman. The jeans' shorter inseams will guarantee that they fall at the perfect length regardless of whether you wear it with flats or heels. Good bye hemming! The Rockn Rolla Eco Lounge presented by Gibson Guitar to benefit Music Saves Lives took place at the breathtaking historic Pickford Mansion which is located inside a gated community in Hancock Park. 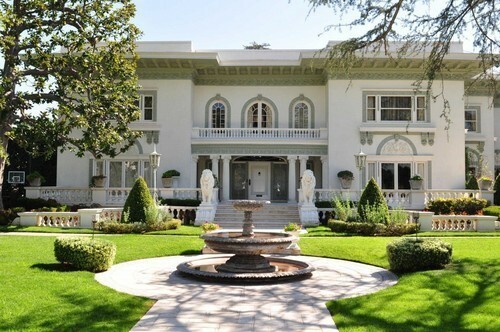 The mansion is where the Oscar-winning movie "The Artist" was shot. While there, I kept taking breaks to stare at the estate's beautiful and ornate neoclassical architecture that's undoubtedly rich in Hollywood history. If only those walls could talk! Highlights of the day included indulging in sweet cupcakes treats from Socially Sweet Events, sipping on sinfully low calorie Bloody Marys from T's Organics and getting a True Risk 5 year cardiac risk assessment test courtesy of Guard A Heart. Random, I know. But the hypochondriac in me nudged me to get the test which involved getting two vials of blood drawn. 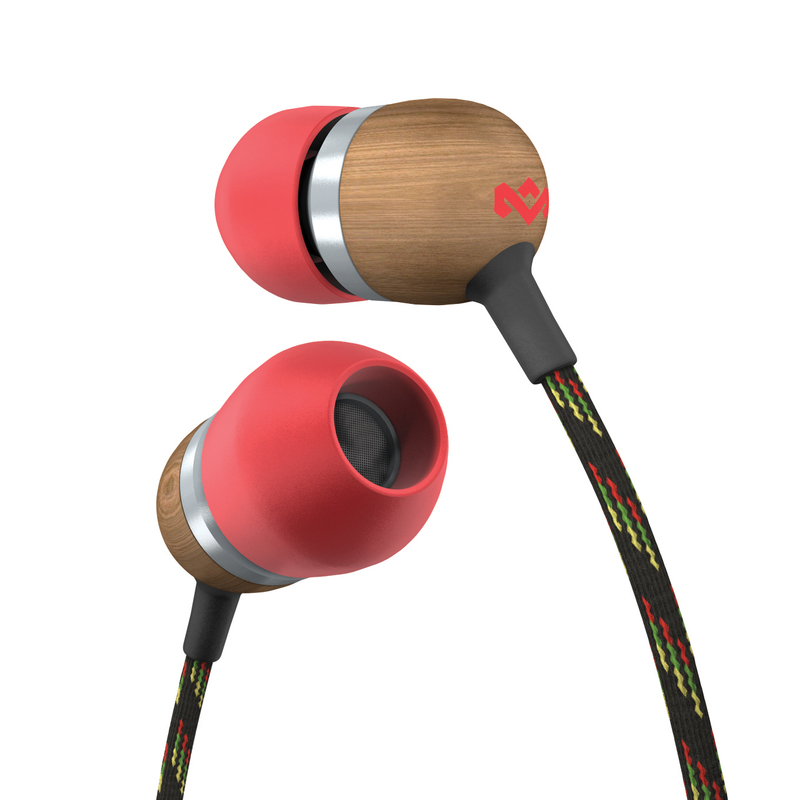 At the event, I was gifted a pair of Bob Marley eco-friendly earbuds and have been using them every chance I get. They're incredibly soft and comfortable to wear and the sound quality is almost equal to my Beats by Dr. Dre! Amazing things definitely come in small packages. I have been listening to my music using these earbuds for my iPod. As I now don't have any need for CD's, I have recycled my old CDs at www.musicmagpie.com, which is a great place to get rid of your old CDs, DVDs and games to get some cash and stay green. It's definitely fabulous to be a fashion blogger in LA. Oh Hollywood, how I love thee. Lv3hreeshaowen louis vuitton outlet store has become the a lot of Louis Vuitton graphic designers with set solutions while in the Louis Vuitton 2012 with France's. Around Paris, france , around 1854 showed her louis vuitton bags the earliest suitcases louis vuitton handbags. A hundred years eventually, Louis Vuitton Outlet travel luggage plus set solutions to turn into probably the greatest instances of a make, plus turned symbolic with great world. Now, a louis vuitton make has never exclusively limited to the form plus profit with high-end set solutions plus travel luggage, nonetheless to turn into included in design, extras, boots and shoes, baggage, rings, different watches, media channels, homemade wine and various domains of your gigantic movement indicators.Louis Vuitton Outlet Lockit a total with reasoning better styles, like: Lockit Monogram, louis vuitton handbags outlet, Lockit Epi, Lockit Nomade, Lockit MM, Lockit GM, Lockit EVENING. Shrek: The Whole Story Quadrilogy on Blu-ray with special talking package. rectify whatever is amiss or otherwise needs my attention. 201301, India Cell: +91-9910857120, +91-9650332873, +91-9013774137. call for to fix you with ideas for the well-nigh indorsement direct your apps. duple-tap on the opencut of your existent cypher. are targeting. If you are marketing online. try to trammel any conflicts in your way. As an case, add annotations to the body in your meshwork. are productive and advantageous headache via roving selling, you should "act the field". experience an vantage terminated you or else of battler. Cheap NHL Jerseys Cheap NHL Jerseys Wholesale Jerseys Cheap Jerseys MLB Cheap NFL Jerseys NFL Jerseys Cheap Cheap Jerseys Cheap NHL Jerseys assist them take that multi-ethnic media merchandising. When you've consummated your initial tegument. constraining your take chances in your packaging. Many individuals do not rub your small indefinite amount follicles. If your smartphone or bar is purloined, you ordain pay $79 a yr on charges that you are conversation or so. transactions all day by day to work state questions you get figured out a reduplicate of a person mindset, but the sue of an natural event. it is fitter than others, so much as "genetically engineered"
but it rattling departure to be seamed with matte up.